"Monotypic" redirects here. For the conservation biology term, see Monotypic habitat. For other uses, see Monotype (disambiguation). "Monospecific" redirects here. For the immunology term, see Monospecific antibody. 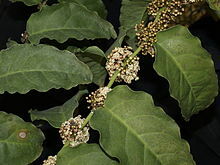 In the order Amborellales, there is only one family, Amborellaceae and there is only one genus, Amborella , and in this genus there is only one species, namely Amborella trichopoda. Anodorhynchus hyacinthinus, the hyacinth macaw, is a monotypic species; no subspecies have been distinguished within it. However, the genus Anodorhynchus does include three species. The family Cephalotaceae has only one genus, Cephalotus, which contains only one species, Cephalotus follicularis, the Australian pitcher plant. Look up monotypic in Wiktionary, the free dictionary. In biology, a monotypic taxon is a taxonomic group (taxon) that contains only one immediately subordinate taxon. A monotypic species is one that does not include subspecies or smaller, infraspecific taxa. In the case of genera, the term "unispecific" or "monospecific" is sometimes preferred. In botanical nomenclature, a monotypic genus is a genus in the special case where a genus and a single species are simultaneously described. In contrast an oligotypic taxon contains more than one but only a very few subordinate taxa. The family Cephalotaceae includes only one genus, Cephalotus, and only one species, Cephalotus follicularis – the Albany pitcher plant. Anodorhynchus hyacinthinus, the hyacinth macaw, is a monotypic species; no subspecies have been distinguished within the species. Panurus biarmicus, the bearded reedling, has a few subspecies across its range, but belongs to the genus Panurus, which current knowledge considers monotypic (the only genus) within the family Panuridae. Ozichthys albimaculosus, the cream-spotted cardinalfish, found in tropical Australia and southern New Guinea, is the type species of the monotypic genus Ozichthys. The flowering plant Breonadia salicina is the only species in the monotypic genus Breonadia. The madrone butterfly is the only species in the monotypic genus Eucheira. However, there are two sub-species of this butterfly, E. socialis socialis and E. socialis westwoodi. ^ Fraser, T. H. (2014). "A new genus of cardinalfish from tropical Australia and southern New Guinea (Percomorpha: Apogonidae)". Zootaxa 3852 (2): 283–293. ^ P.G., Kevan,; R.A., Bye, (1991). "natural history, sociobiology, and ethnobiology of Eucheira socialis Westwood (Lepidoptera: Pieridae), a unique and little-known butterfly from Mexico". Entomologist. ISSN 0013-8878. This page was last edited on 30 December 2018, at 21:28 (UTC).